SIMPLEX 4100ES - SOLUTION SIMPLIFIED! 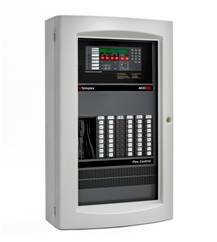 West Vancouver, B. C. - When the nice folks in a condominium high rise in West Vancouver were confronted with the inevitable dilemma about what to do about their aging Edwards 8500 system, the perfect solution presented itself in the form of SimplexGrinnell’s newest entry in the Canadian life safety market, the 4100ES. I don’t normally wax poetic over something as mundane as a fire alarm control panel, but in this instance, I simply can’t help myself. It’s literally the Rolls Royce of fire alarm systems and no doubt represents the apex of this panel’s evolution. Clean, sleek and elegant (words seldom used to describe this kind of equipment, but there’s literally nothing else I can think of that would convey its appearance). About the only real criticism I have is the location of the terminal strips on the legacy initiating modules. The size of the card makes accessing the terminals rather awkward while they’re in place. A CHANGING OF THE GUARD AT ASTTBC AS JOHN SHORTREID RETIRES! Surrey, B. C. - John Shortreid’s has officially retired as ASTTBC’s Registrar. In addition to his normal responsibilities of administering to all matters related to certification, registration and accreditation, John also dealt with issues concerning Practice Review; two disparate and unique roles which he fulfilled with professional élan. As Chief of Staff to the Practice Review Board (PRB) he was compassionate and fair in his dealings with members, but thorough and tenacious in following through the investigative processes involved. He leaves a huge pair of shoes to fill and will, hopefully, continue to actively contribute to ASTTBC’s growth and development! We wish him well! WILL TRANSPORT CANADA START CRACKING DOWN ON UNQUALIFIED EXTINGUISHER SERVICE AGENCIES? next several months, TC Inspectors could start visiting Lower Mainland fire equipment service providers to ensure those engaged in the servicing of low pressure fire extinguisher cylinders are in compliance with the regulations and CSA B339-08. Any company performing requalification testing that isn’t certified (or whom employs uncertified service personnel) will have to comply with the regulations or face stiff penalties under the Dangerous Goods Act. All I can say is: it’ll be about time! To find out if a fire equipment service company is a properly Registered Cylinder Requalifier, click HERE! May 3rd, 2012 - We are saddened today by news of the passing of Richard (Rich) Morris, former Chairman of ULC’s Committee on Fire Alarm and Life Safety Equipment and Systems, a position which he held for twenty-five outstanding years. When he announced his retirement from the Chairman’s role in October last year, I emailed him requesting an interview. I’m sure he won’t mind my sharing his response. It speaks eloquently of his lifelong selfless commitment to keeping people safe. “I sincerely appreciate your interest in interviewing me, Frank. However, I am a pretty modest individual and I hate talking about myself. I feel very blessed that I was one of the first people in North America to witness a demonstration of a Swiss invention that was capable of providing early warning detection and had the potential of saving lives and valuable assets from fire. This was long before anyone in North America had ever heard of a smoke detector - and I am thrilled that I had the privilege of helping to pioneer the introduction of this unique product in Canada and the USA. Rich became involved with CSA’s B-222 Smoke Detector Committee in the late 60’s before the Standards Council of Canada transferred fire alarm standards development to ULC. His devotion and advocacy serves as a source of inspiration for many of us, and he will be deeply missed. I am certain that many will join me in acknowledging that the flame of his lifelong passion will never truly be extinguished and will continue to illuminate our way forward. Tributes celebrating Rich’s remarkable contributions have also been published by CFAA, The Standards Council of Canada, and ULC. AFSA - ALBERTA’S VOICE FOR LIFE SAFETY! Red Deer, Alberta - I had the distinct pleasure of attending the April 27th meeting of the Alberta Fire Safety Association at the invitation of its Chair, Randy Brown. Randy, Kevan Jess and I happen to serve on the ULC Working Group responsible for the Canadian Verification and Inspection Standards (CAN/ULC-S536 and CAN/ULC-S537 respectively). This was the first time I actually got to meet them in person. Randy heads up a fire equipment service company in Calgary, Fahrenheit 451 Fire Safety, while Kevan is the Chief Fire Administrator for the Province of Alberta. This was Kevan’s last official function before he headed off on vacation to Argentina (the lucky guy!). There were several others at meeting as well, representing the spectrum of fire equipment service agencies in Alberta. Ron and Robbin Foxcroft of Fire Safety Services Ltd. in Calgary, specialists in fire suppression system installation & testing, Darryll de Waal of Siemens (and CFAA Alberta Chapter’s Secretary), and Sandy Mackenzie of Riddell Kurczaba (Engineers) were all active contributors. One of the topics under discussion was how the jurisdictional authority over kitchen system installation and service exercised by the City of Calgary is probably going to serve as a model for the rest of the province. In order to install a kitchen suppression system in Calgary you now require the involvement of a registered professional engineer, and this has been extended to modifications of the system as well. Ron has extensive experience in this field and has written the definitive Suppression System course which, I understand, is now being taught at SAIT and is under consideration by the Province of Manitoba’s Fire Commissioner. Kudos, Ron! Sandy Mackenzie provided the group with a fascinating account of his involvement with BOMA (Building Owners and Managers Association) China and offered us a fascinating slideshow of his experiences in the cities of Beijing and Shanghai. All-in-all, a delightful and informative experience! Our stay at the Black Knight Inn in Red Deer was equally fabulous. If you happen to be in the neighbourhood and want to spend a romantic evening with your sweetie away from it all, I highly recommend one of their advertised “Jacuzzi Rooms”!